Readability is a new free application that gives iPhone, iPod touch, and iPad users another powerful tool for consuming web content, online and offline. 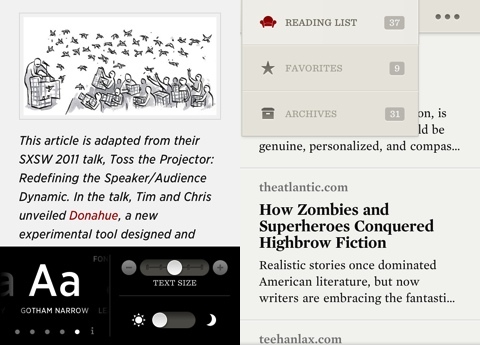 This app affords users a simple way to bookmark and store websites for later reading. Readability then redisplays these websites in a clear and pleasant format that allows for a concise text-based reading experience. This experience is heightened by the great font controls available in Readability. As a long-time Instapaper user, I was excited to try Readability out so I downloaded to my 4S and iPad 2. A lot of the functionality already exists in the form of other forms, namely the apps Instapaper and Read it Later, as well as Safari’s own Reader function. Because Readability is free and does posses some unique strengths, it appears well-positioned to gain in popularity. This is why I think writing a review deserves merit. Readability’s interface is more or less comprised of a navigation panel, article lists, and the actual articles themselves. Due to the tablet version’s extra screen real-estate, Readability can offer the left-hand navigation pane alongside reading lists. On the iPhone app, a drop-down/header navigator is present over article lists. The first of these lists article lists is called “Reading” is dedicated for all your current bookmarked sites. By starring any one these articles, it’s permanently saved and stored into Readability under the “Favorites” list. For older posts or ones you lose interest in, you can either choose to delete them or to send them to the “Archived” list for later retrieval. All your stories can also be shared over Facebook, Twitter, or email. You can also perform a search across anyone of these lists for a specific keyword or add new lists by adding a specific URL or searching with the in-app browser. On the iPhone, there’s pull-to-refresh capablility included in the lists whereas the larger tablet version includes a refresh button on the navigation pane as well. The magic of Readability is that its smooth interface brings the text to such simple primacy in the article view. You can tap anywhere to bring up various controls that otherwise remain hidden. The controls, with understated elegance, fade away after a few seconds. These include swatches for text color, background, and my my favorite, the quick in-article font change control. This looks and works especially great on the iPad app, where the in-article control is exceedingly unobtrusive and really helps users showcase Readability’s amazing font selection. In fact, the inclusion of premium typography is one of the areas that really help set it apart from its competitors. I use Reeder as my main RSS reader across my both of my iDevices as well as my Mac. Readability is really well integrated into it for both bookmarking stories as well as redisplaying them. I’m able to quickly scan my rss articles and save the ones I’m most interested in to Readability for later viewing. If I add a Readability bookmark on either of my handheld devices, I can instantly switch to my other handheld or my Mac to instantly access new articles across all all platforms. It’s all very straightforward and simple to use. Readability can definitely stand toe to toe with its main two competitors Instapaper and Read it Later. The latter are paid apps, so as a free app, Readability definitely offers great value for the price. Despite its strengths, Readability doesn’t necessarily warrant mass migration Instapaper or Read it Now users just yet. I do, however, think users that want to have slightly more control over how their article displays will end up choosing Readability in the end. The new universal Readability app for iPhone and iPad offer an elegant bookmarking and offline reading solution across all your Apple iOS devices. A great addition to any iOS reading collection of apps. AppSafari review of Readability was written by Darius Reimm on March 14th, 2012 and categorized under App Store, Featured, Free, iPad apps, News, Reading, Universal. Page viewed 4642 times, 2 so far today. Need help on using these apps? Please read the Help Page.